1. Divide cookie dough in half into bowls. 2. 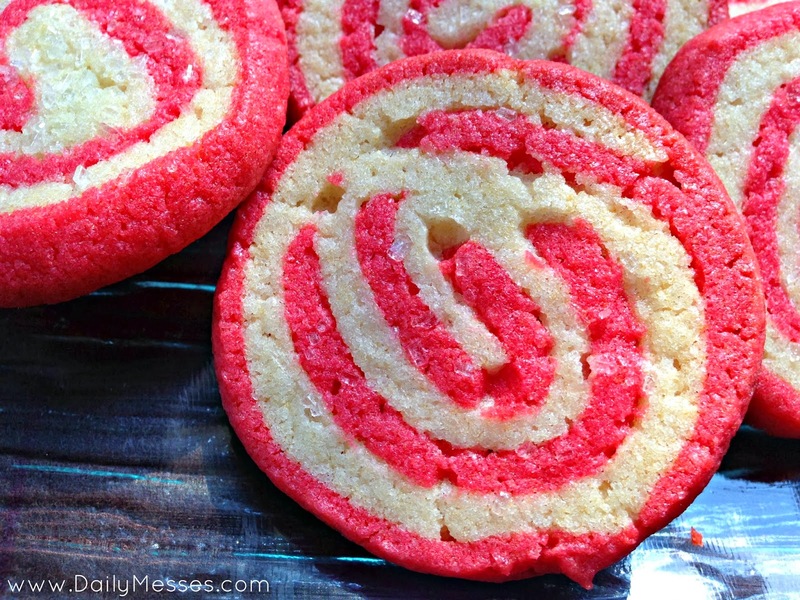 Mix red food coloring into one bowl of cookie dough. 3. Lay a piece of wax paper on the counter. 4. Place half of the white dough on the wax paper and roll into a rectangle shape. DM Tip: To help the dough not stick to the rolling pin, I placed the dough between two sheets of wax paper and then rolled flat. 5. Repeat with other half of white dough on another piece of was paper. 6. 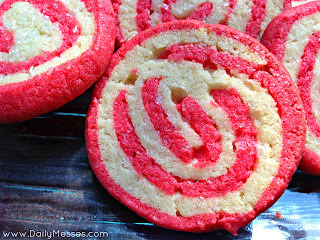 Divide red cookie dough into two and roll into a rectangle shape like the white dough. 7. Place in fridge for 15 minutes. 9. Remove the top sheet of wax paper from the sheets of cookie dough. 10. Place a red piece of dough on the bottom, layer a white sheet of dough, remove sheet of wax paper. Repeat with the other sheets of dough to form two layered cookie sheets. 11. Allow the dough to soften so you can roll it better, about 3-4 minutes. 12. Starting with the long side, roll up tightly into a long roll. Repeat with other layered cookie sheet. 13. Wrap in wax paper and freeze for 1 hour. 14. Cut into 1/4 inch slices and place on lightly greased cookie sheet. 15. Sprinkle with the sparkling sugar and bake for 5-7 minutes. You want lightly browned, but not overcooked. 16. Cool on a wire cookie rack. 1. Use green and red food coloring to make even more festive cookies. You could also use blue food coloring for Hanukkah cookies. 2. Place a layer of icing between two cookies to make Cookie Sandwiches.